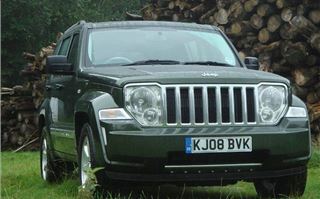 The 2009 Jeep Cherokee is all about filling a niche is the massively overcrowded 4x4 market. 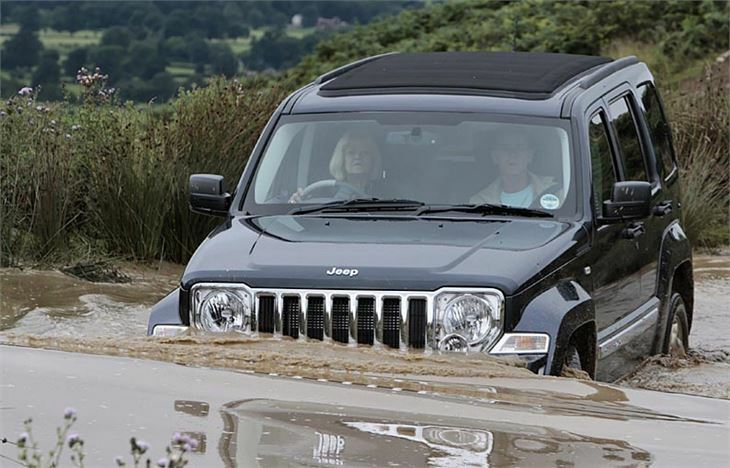 Despite at least 65 4x4 SUVs onsale in the UK, if you want a real off-roader for around £25k, and you need to do certain things, you could find yourself stuck in the mud. 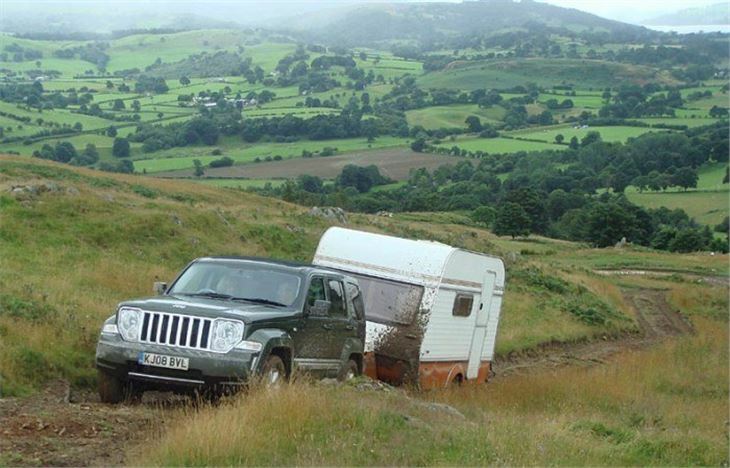 Say, for instance, you have to tow a big twin-axle caravan, or a double horsebox, or a biggish boat, or a sizeable livestock trailer, or a hamburger stand, then you’re caught between a stone and a boulder. 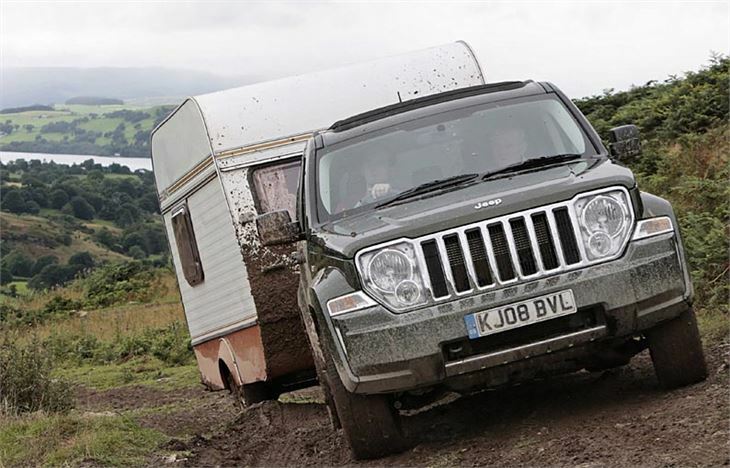 On the one hand there are any number of SUVs that can tug up to 2,200kg. But they won’t be brawny enough. 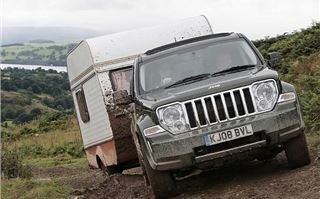 On the other hand there are the big bruisers from Toyota and Land Rover that can haul 3,500kg. But they’re either too crude or too expensive. So you’re left with the KIA Sorento and the Nissan Pathfinder. 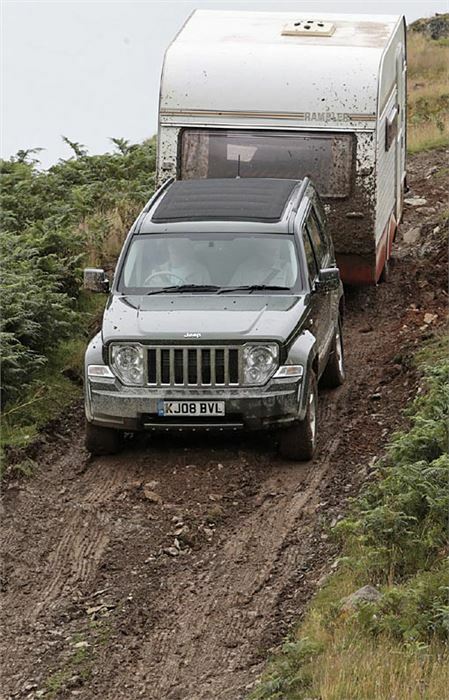 Both good off road. Both capable of tugging at least 2,800kg. 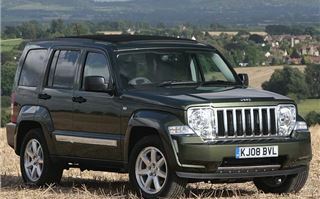 Both offered with manual or automatic boxes and decent diesel engines. Both with no charisma. 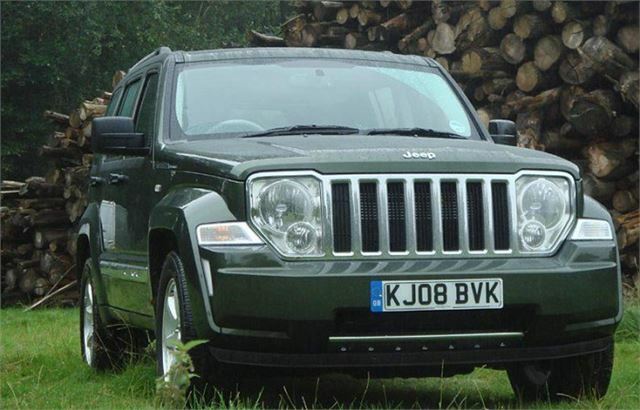 Jeep lost its way with its last Cherokee that just didn’t look like a Jeep ought to look. So the company went back to its roots. Under the bonnet you get the familiar 174PS, 410Nm torque 2.8 VM engine brought a bit more up to date. Under the middle you get a proper transfer box with low range gears and a clever electronic braking system to hold the car down hills. And under the ends you get independent suspension and driveshafts to the front wheels, and multilink suspension with a live axle at the back. 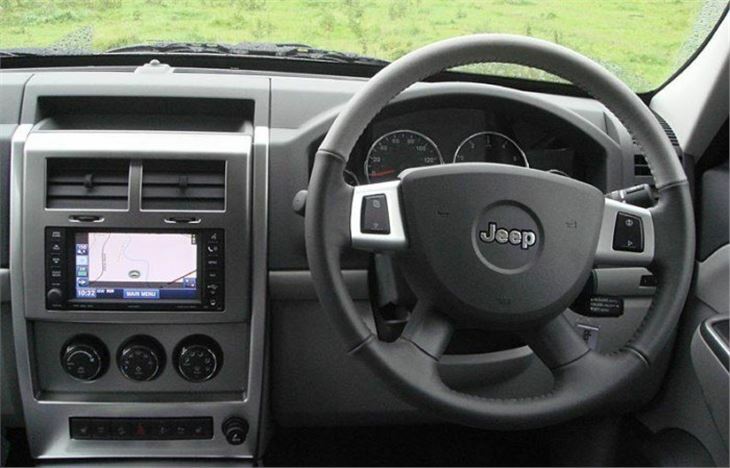 Outside, you get a proper Jeep grille that harks back to General Patton. And the rest of it is no nonsense square-arched Jeep. Unfortunately, there weren’t any 6-speed manuals for us to try on test day because the first new RHD Cherokees to be built are all 5-speed ‘slapshift’ autos. These are doubly unfortunate if you’re thinking in terms of VED groups because at 242g/km, next year they get hit by what the BBC calls “4x4 tax” of £415. The ‘lever Espana’ version (manual) saves you £115 because it’s a mere £222g/km. 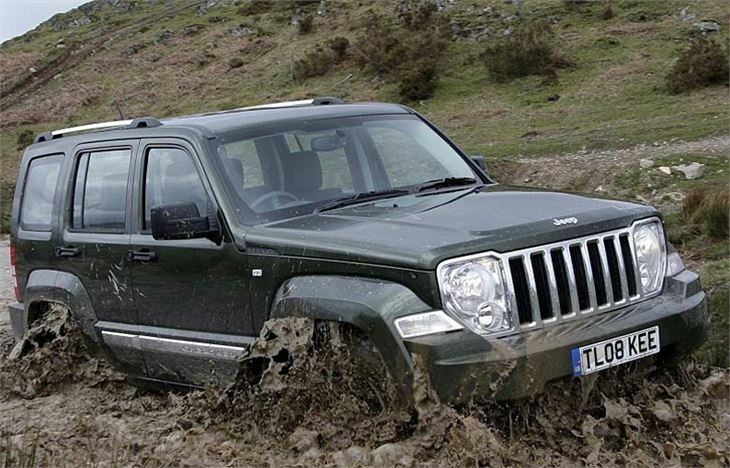 Though faster in the figures, the auto is a soggy old thing on the road. From a cold start the engine clatters like a vintage lorry and the box slurs from gear to gear in a generally unpleasant manner. Far better to take control by waggling the lever left to change down and right to change up. Then, like a well trained Retriever, it’s much more obedient and far more pleasant company. Handling is high-sided on tall wheels. About the same as our D-Max Hi-Lander pick-up. But the 18” wheels with 60 profile Goodyear Eagle RS-A tyres took some of the shocks out of the North Wales test route. 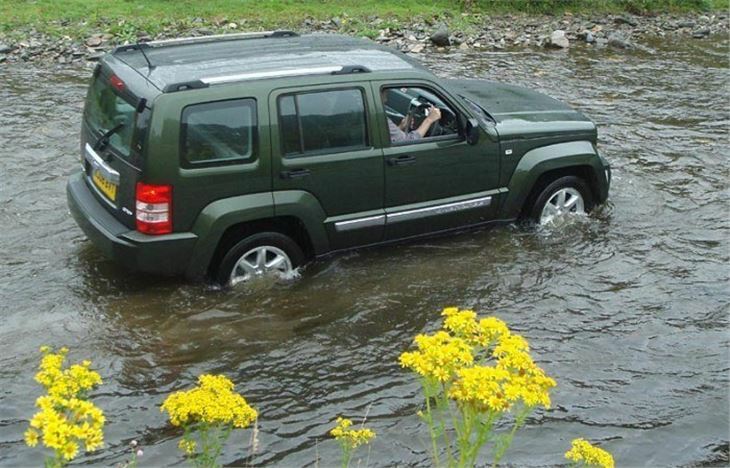 Jeep being Jeep, this included a river drive of about half a mile over a rock bottom, then the Bala off-road course on top of a mountain. Involving 1 in 4 mud ascents and descents, not helped by the rain, and some pond crossings much deeper than the official 1’ 7” wading depth. Since the air inlet is up behind the right headlight, the trick in that is to create a bow wave then stay in the trough behind it. And, of course, that wasn’t all. To prove its shed-tugging capabilities to any doubting Dylan Thomases, they’d bought a small caravan for us to haul over pretty much the same off road course we’d been driving solo. For this, since the Jeep was on Goodyear Eagle RS-A road tyres, they’d dropped the pressures slightly. 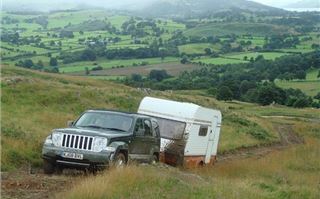 And the car coped admirably, even holding the caravan on downward slopes with its new Hill Descent Control. It’s worth noting that if you accidentally knock the selector out of gear, this will even work while descending in neutral, it’s that good. But while you get Jeep’s new Selec-Trac II full-time 4WD system, including low range, with all Cherokees, both manual and automatic, the manual doesn’t come with Hill Descent Control. The other advantage of the automatic is 460Nm torque v/s 410Nm for the manual, so pulling power is at least equal. And the variable vane turbo helps make sure you can keep the engine in its maximum torque range. There is no old lag at the lower end of the rev range. 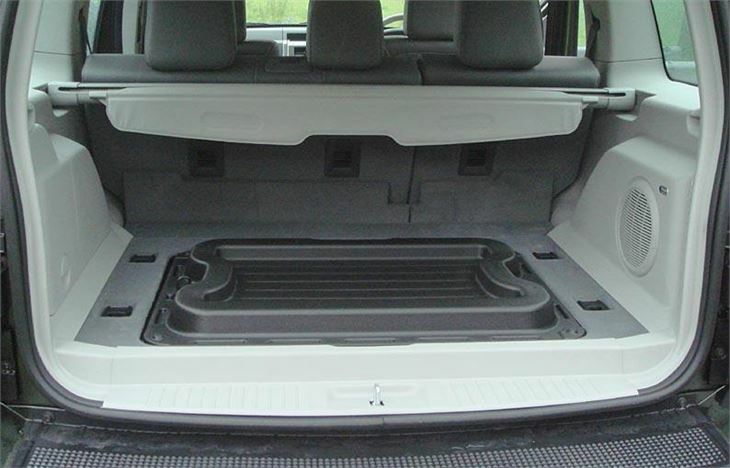 It’s a full 5 seater, with plenty of head and legroom for five, though the transfer box intrudes quite rudely into the front passenger’s footwell. 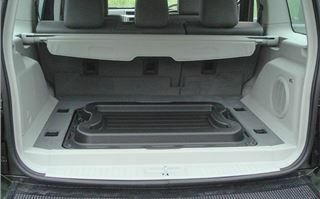 The glass back window opens separately in the hatchback. The high load floor has wet storage underneath and is reversible to hold objects like freshly caught flapping salmon in place. The optional satnav is up to date with a hard drive for uploading new mapping and includes a Bluetooth hands-free phone system. The ‘Sky Slider’ electric canvas roof is an interesting option because it’s virtually the full length of the top, supported by a hefty roll bar over the rear passenger’s heads. 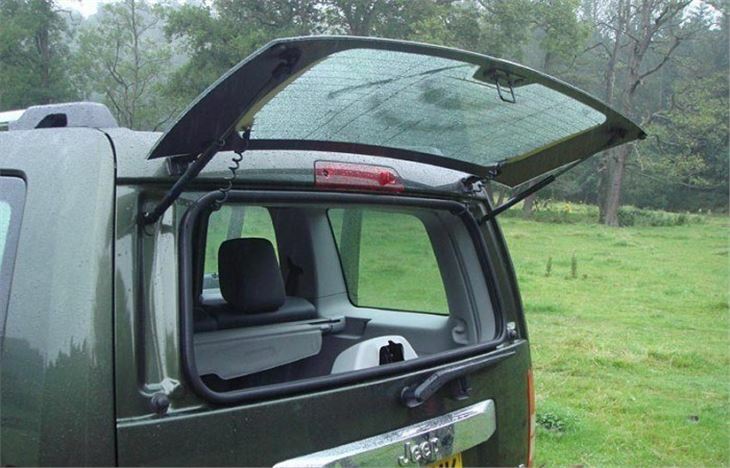 You can slide it back from the front or forwards from the back, with the furls meeting somewhere in between, and it can be opened or closed on the move at up to 80mph. Usefully, it’s higher than most people’s eyes so is not vulnerable to vandals like a sportscar’s top might be. 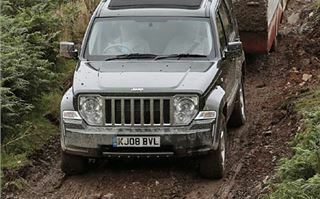 You have to forgive the new Jeep Cherokee its relatively crude engine and the automatic its slurry changes and tax disadvantage. But it definitely fills a niche and spreads its charms both above and below. 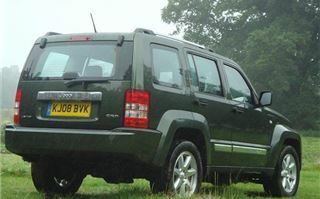 If you need just one car for the school run, for suburban shopping, for hauling a double horsebox and for getting to the butts on a grouse moor then this Jeep does the job very well. For prices, specs, engines, dimensions, performance and alternatives please click the tabs.